Romney H. Entrekin is a shareholder with Burson Entrekin Orr Mitchell & Lacey, PA Mr. Entrekin focuses his practice in the areas of litigation, medical malpractice, railroad law, insurance claims defense, and employment law. 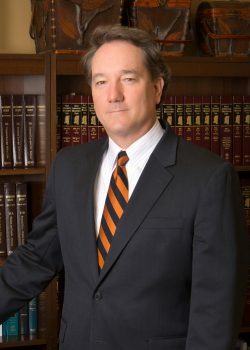 Mr. Entrekin served as the President of the Jones County Bar Association in 2002. He is also a member of the International Association of Defense Counsel, the American Health Lawyers Association, the Mississippi Defense Lawyers Association, the Defense Research Institute, and the National Association of Railroad Trial Counsel. Mr. Entrekin has received an “AV” peer review rating from Martindale-Hubbell, the national directory of attorneys. This is the highest possible rating, indicating preeminent legal ability and the utmost ethical standards. Mr. Entrekin obtained his Bachelor of Sciences degree from Mississippi State University and his Juris Doctorate from the Louisiana State University Law Center. He was admitted to practice in Louisiana in 1990 and Mississippi in 1992. He is also admitted to practice before the U. S. Court of Appeals for the Fifth Circuit as well as the U. S. District Courts of Mississippi and Louisiana. From 1990-1992, Mr. Entrekin served as a law clerk for the Mississippi Supreme Court. Mr. Entrekin is active in the community serving on the Board of Trustees for Laurel Christian School and serving as an Elder at Westminster Presbyterian Church.